CCM 4012 Range: 5.0 oct (C2-C7). Bars: Honduran Rosewood. Bar Sizes: 71x27-40x21. . Pitch: A=442. Frame: Total Suspension System. Resonators: Tunable-Clamp System. Height: 90. 5 - 111.5 cm. Casters: Extra Large with brakes. Custom Classic 4000 Series. Our 4000 series are designed for the 'gigging' marimba players. The frrames, resonators and stands are modular and very easy to break down, transport and set-up. The unique and improved 'one touch' button provides total height adjustment in just seconds. The 4000 series marimbas are available with premium Honduran Rosewood or concert quality African Padouk bars. Using the greatest care, we select wood, hand tune resonators and all Vancore design skills, to produce these superb percussion keyboard instruments. Featuring this finest in traditional craftsmanship and the very latest in material technology, we give you an instrument rich and focused in tone. The instruments are total transportable and height adjustable through Vancore patented Total Suspension System. If the ultimate in sound and quality is what you want, consider these royal series of mallet instruments. Vancore Comfort Lifting The fully integrated lifting system is new and absolute unique on the market. An ergonomically design with a simple “step on the pedal” system. Vancore did design the patented gas lift system decades ago. Based on the experience we did succeed in designing the exclusive “Vancore Comfort Lifting System”. The best height adjusting system ever made!! Specially designed for you! Resonator System: Vancore resonators are individually hand tuned and assembled to an exclusive mounting system. This system eliminates every kind of rattle or extraneous noise. Unlike other resonators, which or welded or riveted, Vancore system employs minimal. Floating Bar Suspension: Most notable is the new Floating Bar Suspension System (FBS). This proprietary bar support system actually increases bar resonance by 20%! Precision laser cut bar support arms are angled to insure that each and every bar is supported exactly to the nodal point. Locking Rail System: Vancore new Foldable rails with unique Locking Rail System guarantees that the solid Ash rails stay straight! NEW! Tunable Resonators. After years of research Vancore R&D team has chosen rectangular bass resonators which produce optimum resonance and projection in lower registers. These resonators are tunable now! In addition. Vancore skilled tuning experts expertly tune each bar to exacting pitch standards. 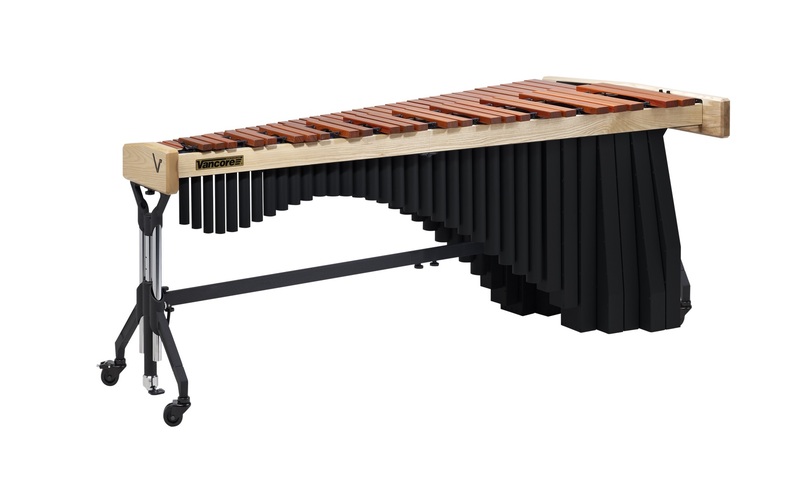 Vancore 4000 series are designed for the 'gigging' marimba players. The frames, resonators and stands are modular and very easy to break down, transport and set-up. The unique and improved 'one touch' button provides total height adjustment in just seconds. The 4000 series marimbas are available with premium Honduran Rosewood or concert quality African Padouk bars. Artist Marimba MAHUF43 University, 4.3 Oit.